Elisabeth brings project creation, development, and management experience as a part of interlinking teams in highly competitive markets. Her career started in media and took her from small-market radio reporter to journalist/producer in national and international network and syndicated radio and television. Credits include: Los Angeles Bureau Chief, The Christian Science Monitor (international radio division), reporter/editor, Marketplace on non-commercial radio, and Producer/Department Head ABC Radio Networks with Armed Forces Radio internationally. She’s also worked for national print and Internet publications as a writer and editor. 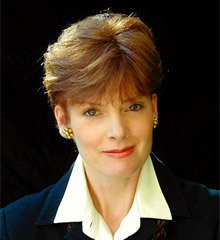 Over the years, Elizabeth has created and developed several programming packages including a foundation-funded science TV series for adults, which was not ultimately green-lighted for production. After years of following the solar “feed-in tariff” model in Germany, Elizabeth joined Absolutely Solar in the first quarter of 2013 at the launch of the Los Angeles Feed-in Tariff program. She very much enjoys working on an experienced, diverse team in a rapidly developing market, but more, she enjoys working to develop and commission the best solar system to suit each client’s individual needs.